Clover, Birdsfoot Trefoil and Chicory. This product is the result of many satisfied turkey hunters reporting on their successful hunts using Monster Mix. We decided it was time to develop something specific for those looking to plant a dual purpose plot. 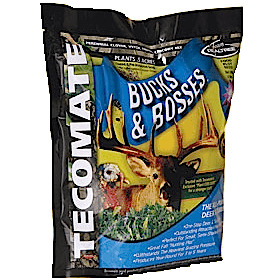 In the spring this perennial mixture provides nutrition and attraction with quality forage for hens and “Boss Tom” turkeys. During the summer it will provide an excellent bugging area. Throughout the spring and summer antler-growing season, bucks will utilize these plots as a major protein food source. Does and fawns also use these plots for optimum health and nutrition. Bucks & Bosses is tolerant of partial shade and may be successfully frost seeded in early spring making it an excellent food plot in hidden spots for those up close bow plots. To insure the best possible stand we have coated this mixture with our proprietary Yellow Jacket seed coating. Tecomate recommends liming if the pH is below 6.5 and fertilizing with a phosphorous heavy fertilizer at the rate of 200 to 300 pounds per acre. No-till drill, cultivate and broadcast or cultivate and drill seed. Plant at a rate of 8 pounds per acre. When broadcasting, cover seed by dragging or cultipacking. Avoid planting too deep, disking is NOT recommended. Plant 1/8 to ¼ inch deep in good moisture. Can be frost seeded in colder climates. 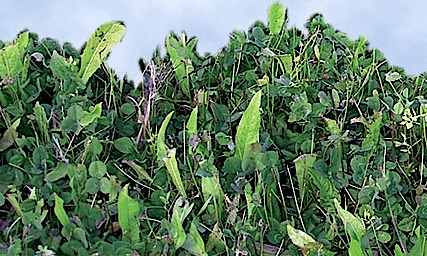 Use grass selective herbicide or mow to about 6 inches high in spring/early summer. Re-fertilize at recommended rates from routine soil samples. Overseed to refresh plot.